Pick equal sized and wrinkle free stout green chilies. Take water in a bowl and add the green chilies and w3ash thoroughly. Spread the washed chilies on a cloth and dry them in shade. Using a safety pin, make a vertical slit on a green chili. Similarly make vertical slits on all green chilies. One may remove some seeds for less spicy vamu mirapakayalu. In a clean and dry mortar add carom seeds and salt and crush them using pestle. Grind the carom seeds slightly to release flavor. Take the coarsely ground carom mixture into a plate. Take a green chili and press lightly at the top with thumb to open up the chili near the slit. Take sufficient stuffing and stuff the chili. Place the stuffed chili in a plate slit portion facing upwards. Similarly stuff the remaining chilies. While stuffing the chilies, at times we stuff more filling unknowingly. Then we get the doubt that whether the remaining stuffing would be sufficient for the remaining chilies. To tackle such situation, when half the chilies are stuffed, shake the plate in which the stuffed chilies are placed so that the excess stuffing spills into the plate. 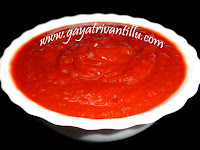 Salt oozes moisture from chilies and thus the carom seeds mixture sticks to the chilies. Once the plate is shaken, excess stuffing falls into the plate---but remember not to shake vigorously or else the entire stuffing may come out of the chilies. Stuff the taken chilies with the prepared stuffing and spread in plates in single layer. Place the plates under sun to dry on terrace. Place a wire mesh above the plates to protect from birds. Daily morning till evening place the plates under sun and dry till they are crisp. On fourth day evening, observe that the chilies are fully dried. When they are fully dried they store well without getting spoilt. Place the dried chilies in a jar and cover with a tight lid and store. As and when required take few and fry them in oil and serve. Let us fry some and see how they taste. Heat sufficient oil in a pan and drop few dried chilies and fry stirring. Stirring while frying, helps the chilies brown evenly. As soon as they change color to golden, remove them from oil using a slotted ladle. Even after removing from oil also they get fried with the heat in them---thus changing a bit darker in color. Serve these vamu mirapakayalu with less spicy curries, dals or with curd rice. Use stout green chilies which are generally less spicy. See that there are no wrinkles on the chilies and are of equal size. If possible use chilies of thumb size as we require less oil to fry small sized chilies. Here I have taken 50gms salt for 15gms of carom seeds and the mixture is perfect for the spiciness of the chilies. Adjust quantities as per taste and preference. As it is these stout chilies have less seeds but some may contain more seeds---if one feels to have less spicy chilies remove some seeds but do not remove all the seeds then there won’t be any flavor left. For crushing the carom seeds I have used mortar and pestle instead of mixer grinder. We need not make fine powder of carom seeds---slightly crushing the seeds releases the flavor of carom seeds. Using a mixer grinder we do not have control on the texture of carom seeds. If mortar and pestle is not available, crush with a rolling pin on a clean platform. To separate excess stuffing from chilies do not shake the plate vigorously---just a light shake so that the stuffing which is not sticking to the chilies would fall in the plate. Preferably shake the plate from left to right lightly---but do not toss the chilies or else the entire stuffing comes out of the chilies. The salt oozes moisture from the chilies and that moisture helps the carom mixture sticking inside the chilies. Dry the chilies thoroughly, till all moisture is evaporated and chilies are crisp---then they have long shelf life. In summer season make these chilies and they keep for one full year. If they are not dried properly and stored in jars they catch fungus. To fry the chilies, always use sufficient oil---the chilies should be drowned in oil—or else they do not get fried well in less oil. When these chilies are fried in oil some of the dried stuffing may fall in oil and the oil may be spoilt. Strain this oil and use this oil for seasoning in daily cooking. 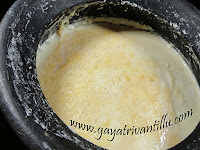 Heat a one or two table spoons of oil in a pan and fry the vamu mirapakayalu and keep them aside. Make pieces of papad and fry them in the remaining oil. Crumble the fried chilies and fried papad pieces with fingers. In the remaining oil add some cumin seeds and allow them to splutter. Add leftover rice or freshly cooked rice along with the crumbled fried chilies and crumbled fried papad pieces and toss well. a tasty rice dish is ready within no time. This rice dish is a favorite especially when one is suffering from cold and fever. Try this new dish and enjoy. When there is shortage of vegetables at home such dried things come handy to enjoy a tasty meal. So do make such delicacies when possibility is there. I have tasted this recipe a few years back at my mother-in-laws place. This time when I met her she gave the recipe and hence I made this recipe there only as I do not have the privilege of drying under sun as I stay in an apartment now. So for those who are fortunate to have access to terrace and facility of drying under sun make these tasty vamu mirapakayalu watching the movie from this site.